Mitosis is the final stage of the cell cycle where a copy of the duplicated genome condensed into chromosomes is transmitted to each daughter cell. Failure to do so produces daughter cells with an inappropriate genome content, also called aneuploidy. The mechanisms that safeguard cells against aneuploidy are of great interest as aneuploidy contributes to tumorigenesis. Our group has identified two novel mechanisms that permit the accurate transmission of chromosomes during cell division. The first mechanism involves the faitful segregation of damaged chromosomes. The second mechanism coordinates chromosome segregation with cell cleavage. Aneuploidy can arise from aberrant cell divisions due to failure in DNA repair or defects in chromosome segregation. To prevent aneuploidy, the cell relies on checkpoints. The DNA damage checkpoint acts in interphase to prevent the cell from entering mitosis in the presence of altered DNA. This provides time for repair of the DNA breaks. The spindle assembly checkpoint acts in mitosis to delay anaphase onset until all chromosomes are properly attached to the spindle microtubules via their centromere/kinetochore region. This mechanism ensures that each daughter cell inherits the correct number of chromosomes. Checkpoints can be bypassed by a process called adaptation. Adaptation to the DNA damage checkpoint results in a situation in which the cell enters mitosis with damaged DNA. DNA damage can occur during mitosis as well. Going through mitosis with DNA double strand breaks (DSBs) is particularly problematic as it results in the production of chromosome fragments lacking centromeres (acentric fragments). Since the centromere is required for kinetochore function and thus chromatid segregation, these acentric chromosome fragments would be incapable of moving poleward during anaphase. If unchecked, this situation might lead to the production of aneuploid daughter cells. What is the fate of a cell going through mitosis with broken chromosomes? Is there a mechanism that processes broken chromosomes in mitosis and thus prevents the production of aneuploid daughter cells? To address these questions, we study the behavior of cells entering mitosis with damaged chromosomes via the expression of the endonuclease I-CreI, which creates DSBs at one locus on the X chromosome. While I-CreI expression generates four broken chromatids in the majority of dividing cells, remarkably, it has no effect on adult survival. Live studies reveal that acentric chromatids segregate efficiently to opposite poles. The acentric chromatid poleward movement is mediated through DNA threads (called “tethers”) that connect the acentric fragments to their centric partners. These tethers are decorated with Polo kinase, a key mitotic regulator, the spindle checkpoint component Bub41 and the chromosomal passenger complex proteins (CPC), Survivin, INCENP and Aurora-B but not the spindle assembly checkpoint components Mad2 and the centromere histone variant Cid/CenpA. Reduced BubR1 or Polo function results in abnormal segregation of acentric chromatids, a decrease in acentric chromosome tethering and a great reduction in adult survival. 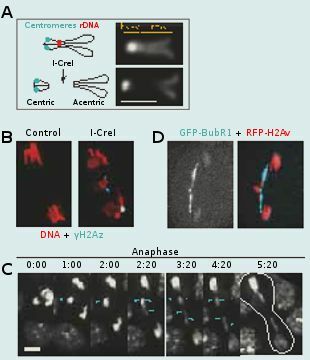 Thus we propose that BubR1 and Polo facilitate the accurate segregation of acentric chromatids by maintaining the integrity of tethers that connect acentric chromosomes to their centric partners. We are currently investigating the molecular pathway by which BubR1, Polo and the CPC components control the proper segregation of broken chromatids. Figure 1. BubR1-coated DNA tethers facilitate the poleward segregation of acentric chromatids. (A) Schematic illustration (left) and DAPI staining (right) of the Drosophila mitotic X chromosome. The centromeres (cyan circles) are near the telomeres in the heterochromatin “head” brightly stained with DAPI. The endonuclease I-CreI cuts at the rDNA locus located in the pericentromeric heterochromatin. I-CreI generates two distinct chromosome fragments, a small heterochromatic fragment containing the centromeres (centric) and a long fragment containing the sister chromatid arms (acentric). Scale bar, 2 µm. (B) DAPI and γH2Az staining of control and I-CreI-induced neuroblast anaphases. (C) Time lapse images of mitotic GFP-H2Av-labeled neuroblasts from heat shocked larvae expressing I-CreI. The acentrics (cyan arrowheads) are aligned at the metaphase plate. At anaphase, they lag behind the main chromatids but eventually move toward the poles. Two acentric fragments are seen moving toward each pole. The white lines in the last column highlight the contour of the dividing cells. Time, min:sec. Scale bar, 5 µm. (D) Anaphase cell from I-CreI heat shocked larvae double labeled with GFP-BubR1 (cyan) and RFP-H2Az (red). GFP-BubR1 stains the tether that links the acentric broken fragment to its centric partner. My group is equally interested in addressing the fundamental, yet largely uncovered issue of how chromosome segregation is coordinated with cell division. This coordination is essential for proper transmission of the genetic material into daughter cells. To address this issue we monitored cells going through mitosis with abnormally long chromosome arms induced by I-CreI expression. We have previously shown that I-CreI expression results in the production of acentric and centric chromosome fragments that remain attached through a DNA tether facilitating their proper segregation. In addition, we observed that this DNA tether stretches and then recoils during anaphase, transiently increasing the length of the chromatid arms. These abnormally long chromatids lag at the cleavage site during anaphase/telophase, increasing the risk of being trapped by the cell division machinery. This would lead to the production of aneuploid daughter cells. We made the striking observation that the cell adapts its length to the length of the trailing chromatid arms. This cell elongation is concomitant with the spreading of cortical myosin rings without compromising cytokinesis. The activity of the Rho Guanine-nucleotide exchange factor is required to mediate this response. These studies reveal a novel chromatin to cortical myosin signalling pathway that ensures clearance of the chromatid arms from the cleavage plane prior to the completion of cytokinesis. We are currently investigating the underlying mechanism by which the trailing chromatid arm triggers cell elongation. Figure 2. Cell elongation is an adaptive response for clearing long chromatid arms from the cleavage plane. 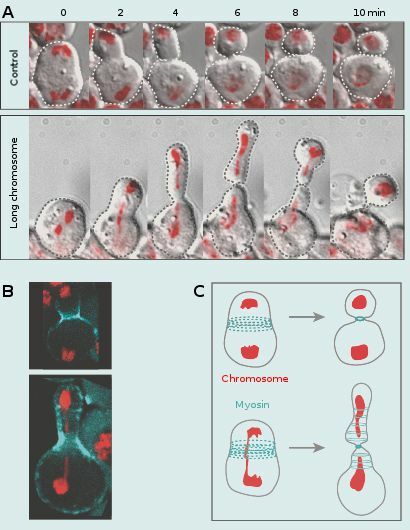 (A) Time-lapse images of control cells (top row) and cells carrying an abnormally long chromosome (bottom row). The chromosomes are marked with RFP-H2Av. The cell carrying a long chromosome transiently elongates during anaphase and rounds up once the chromatids have cleared the cleavage plane. (B) Still images of control cell (top row) and cell with long chromosome (bottom row) expressing RFP-H2Av (red) and Myosin-GFP (cyan). Cell elongation is associated with a broader cortical myosin distribution. (C) Model for coordinating chromosome segregation and cell division. In anaphase, the presence of long chromatids at the cleavage site triggers the formation of extra myosin rings beyond the main contractile ring. These extra myosin rings deform the cortex provoking the elongation of the cell.